The water has calmed down considerably. It is not as stirred up with a little color returning. The best bet is Black Drum biting clams. The clams seem to be the preferred bait today. A few Mackerel are still taking other baits as well as a few Snook and nice Redfish. There have been some Flounder caught but not the numbers expected this time of year. Flounder should peak in December when we get a cold snap. Not looking promising with temps in the mid-80's, predicted for Wednesday. Rob Moore managed some small Flounder and this nice 6-pounder caught off the south side rocks this weekend. The north wind has also made it challenging to fish from the beach this week, but if you time it right (and get a little lucky) you can find jacks, pompano, Spanish mackerel and bluefish up and down the coast. The east side of the Indian River has been good for redfish and trout, especially in the little mosquito ditches. You really need to hug the east shoreline – which is easier said than done when the wind is cranking. 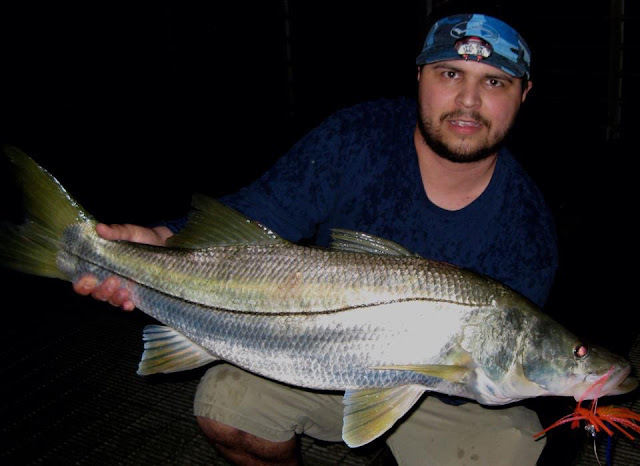 Snook are biting at night and around the bridges, and the best action is during the outgoing tide. There are also Spanish mackerel and bluefish at the bridges. 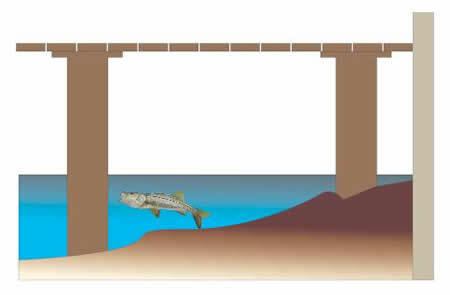 Snook and mangrove snapper are chewing around the bridges and other structure in the Intracoastal Waterway in Jupiter. There are also jacks in the area. A few redfish have also been snagged close to the jetty near the Jupiter Inlet. Through central and southern Palm Beach County, it has been snook and snapper around the Intracoastal bridges at night, along with a good number of jacks. If you can get – and stay – there, the best bass fishing on Lake Okeechobee this week remains along the outside edges and back in the grass. It has been difficult because of the windy conditions, but those who succeeded, were rewarded with some nice fish – including a few over 6 pounds. Live shiners are still working better than artificial lures, and the number of fish being caught has really increased. That number will only improve as we get into December and once the wind subsides. Inshore the snook fishing has been good around the bridges and in the inlets on the outgoing tide live pig and pinfish have been the best bet.The south jetty in Ft.Pierce has had a few snook and tarpon around on the outgoing jigs and big grubs have worked the best.To the north around Harbor Branch has had some nice snook and trout up in the mangroves around first light and late in the afternoon live bait and topwater have produced very well.The snapper bite around the bridges and channel edges has been good with live shrimp on the out going tide. 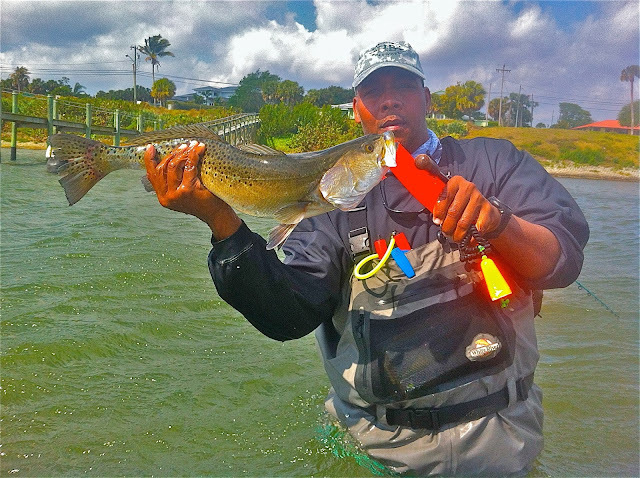 Inshore there has been a few reds around Harbor Branch with a few trout mixed in on the out going tide,To the south around Midway road has been good with a few reds and a few trout around the docks topwater has worked good and soft baits. The snook fishing has been good around the bridges at night on the outgoing tide with jigs and trolling plugs. Only those that brave the rough conditions will find limited success. Occasional bites will continue in spite of the 25 mph NE winds and up to 11 foot seas. Fishing this week and weekend will be invigorating to say the least. It is usually during these conditions that a few trophy fish are hauled in by the patient anglers. So, get out there and have a Happy Thanksgiving weekend. What is certain is that fish and bait will be moved around to set up an exciting December! We have dark skies over the inlet this morning. Winds are blowing out of the East-Southeast at 16 mph, gusting to 22 and the water is choppy. NOAA has issued a small craft advisory through Thursday evening. The extended NOAA forecast looks poor for our offshore boaters. High seas and rough conditions are predicted over Thanksgiving weekend. Choppy conditions aren't keeping the fish from biting. Reds, Snook, Black Drum, Spanish Mackerel, Jacks, Blues, a smattering of Sheepshead, Lookdowns, Margate and Flounder have been active. Tarpon have been hitting in the evening hours. Our angler of the day is Garrett Fertig of Indialantic. Garrett fished the north jetty sea wall when he landed and released his under slot Snook. Garrett used live shrimp on light tackle to land the fish. part is it is working and yes the Reds are blasting it out of the water and yes I still can not catch catch one on a top water. watch those slots and they will feed face into the current. the fish. Blues to four pounds and the cool part of it they were there most of the day. It's a blustery morning at the inlet. Winds are blowing out of the North-Northwest at 21 mph, gusting to 27 and the water is choppy. NOAA has issued a small craft advisory through Wednesday evening. The rest of the week looks rough for boaters. 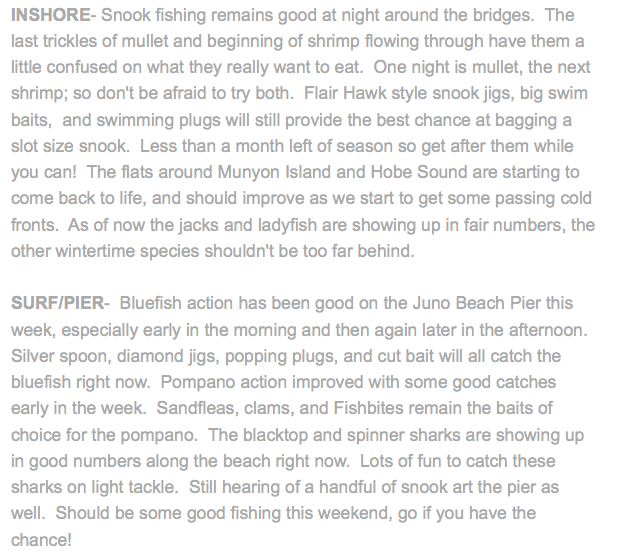 The weekend was productive for our inlet anglers. The rough conditions, wind and rain only helped improve the bite. Snook, Reds, Spanish Mackerel, Blues, Ladyfish and Jacks were all active. We're starting to see more Black Drum and Flounder on the move! Sheepshead should be arriving in larger numbers as well. Our angler of the day is Hank Christianson of Melbourne. Hank landed the 26" Black Drum off the north jetty using clams. Inshore the reds have been around on the north bridge flat with a few nice trout mixed in.The snook fishing has been good around the bridges on the out going tide with live bait and jigs.The pompano bite has been good off J.C. Park on the incoming tide sandflease and little green and pink jigs have produced well.The south jetty in Ft. Pierce there has been a few flounder around with some pompano mixed in. We started off the morning with rain and lots of clouds. It cleared up and it's a beautiful afternoon at the inlet. This afternoon winds are blowing out of the North at 16 mph, gusting to 19 and there is a moderate chop on the water. The bite was not so hot this morning. A couple of slot Snook came over the rails in the early morning hours but most of the morning activity came from Jacks. A couple of Blues, Ladyfish, one Pompano and a couple of very small Black Drum were landed and released; overall it was a slow morning at the inlet. We have overcast skies at the inlet this morning. Winds are blowing out of the South-Southwest at 4 mph, gusting to 6 and there is a moderate chop on the water. NOAA is calling for small craft to exercise caution this morning. We have a chance of showers this morning, likely showers this afternoon with possible thunderstorms. Go prepared if you head to the inlet. The Snook bite remains good. Please handle catch and release species with care. 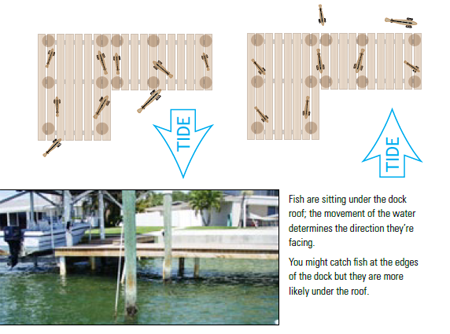 Try to lower the Snook back into the water via net if it is caught off the north jetty. 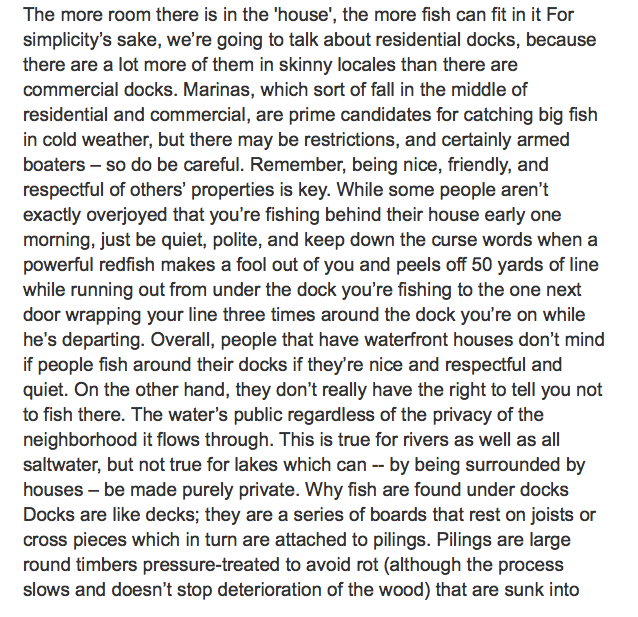 Please read the FWC catch and release guidelines in the top right corner of this page. This morning there have been a lot of Jacks come over the rails of the jetties according to Tommy Turowski at the Sebastian Inlet Bait and Tackle Shop. Our photos today is of Susan Barr who was visiting from London and landed two smaller slot Reds, 18" and 19", two catfish and a small Jack. One of the Reds gave her quite a battle, but she prevailed in the end. The Red got stuck in the rocks and one of the local anglers climbed down to retrieve it. Summer weather continues along the Treasure Coast. Last year it was cold for us, but this has been the hottest year I can remember in 35 years in Florida. It has been in the mid to high 80's again this week and appears to continue for a while longer. Water temps have dropped into the mid 70's and that brings in the pompano, bluefish and mackerel to the area. Winds have blown for several weeks now and that makes it a challenge to get out fishing. Expect more of the same next week and be safe out there. The fish have been biting where you can find some shelter from the strong winds. Look for a variety of fish around mangroves, docks and bridges, Redfish, snook, snapper and many other species can be caught in spite of the windy days. Conditions are gradually changing into winter patterns. 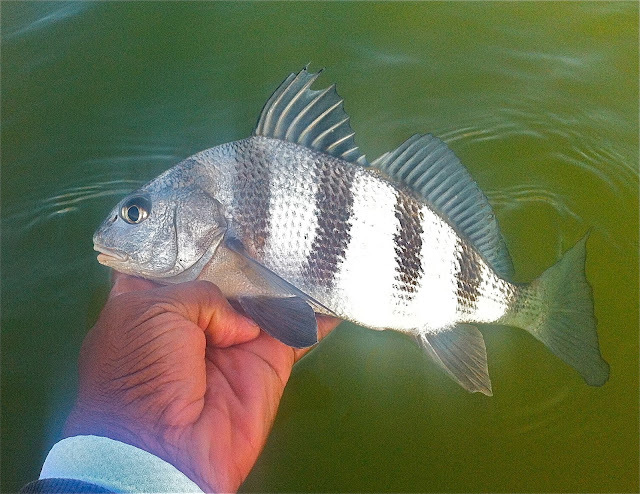 Look for more pompano, sheepshead, black drum and bluefish to filter into the area as water temps drop. Slow down your lure retrieves as fish will get lethargic and slower moving to strike a lure. DOA shrimp, CAL jerk baits and live bait will all work when presented properly to the fish. 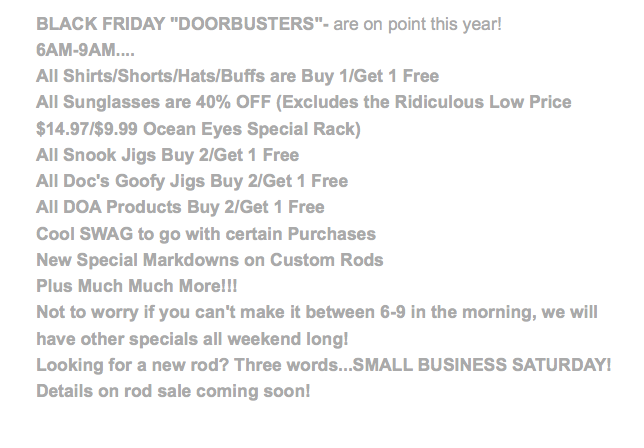 DOA Bait Busters, feather jigs and live bait will work on snook around the inlet, docks and bridges. Even though it is a challenge on most days, I love winter fishing action on the Treasure Coast. With the huge variety of fish that move into the area, you can't help but catch fish. I am a lure fisherman. I hate to admit just how many snook lures I own. That is not to say that I don't use live bait at times. I have no qualms against live bait. I just enjoy fooling fish on a fake bait. 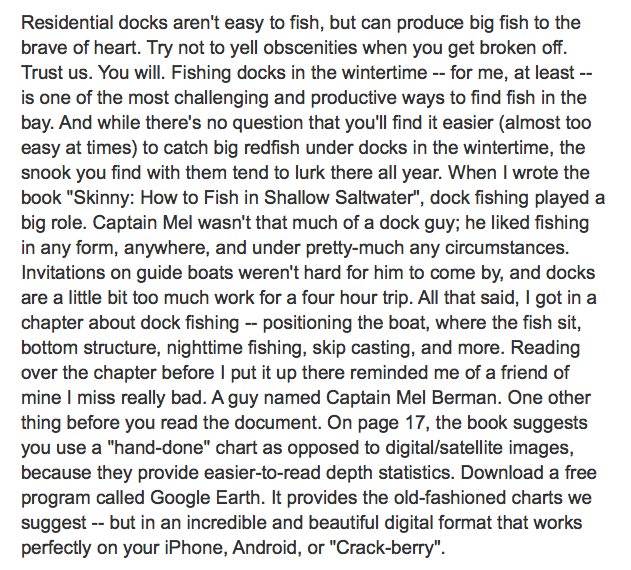 I also like the fact that I don't need to spend any time searching for live bait. Just finding live bait can take lots of time. Sometimes you can't even find any at all. That's why I think everyone should learn to fish a few lures. Right now is a good time to go out and fish lures. The mullet run has slowed considerably. However, the snook are still in all the same spots looking for those last few stragglers. A properly presented lure should yield some fish. As the water cools snook will focus on smaller baits such as shrimp. Then a smaller lure is preferable. Find a few lures that you have confidence in and stick with them. Some days you will be out fishing many of the live baiters. We have high winds at the inlet this morning. It's blowing out of the Southeast at 23 mph, gusting to 28 and the water is choppy around the jetties and on the ICW. There is a small craft advisory through this evening. The bite has been good. We're seeing a lot of Snook and Reds, Spanish Mackerel, Jacks, Black Drum, a few Sheepshead, Flounder and Margate come over the rails. Live shrimp is the preferred bait for Snook. With the water temperature starting to cool down, we are looking for the Black Drum and Sheepshead bite to pick up. The big Flounder cant be far behind! Our photos today are courtesy of inlet regular Mike Ricciardi of Vero Beach. Mike took the shot of (L-R)Dale White of Palm Bay, Ricky Lloyd and Charlie Jones both of Vero Beach.That morning was productive for anybody fishing for Snook. Photo two features inlet regular Dave Vermilye of Sebastian. Dave landed his slot Snook using live shrimp. 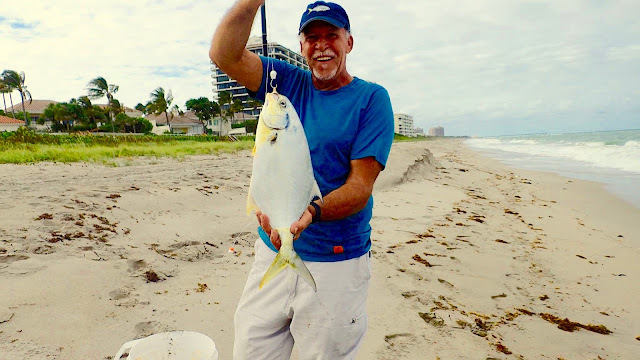 Whiting, croaker, jacks, bluefish and a few pompano are being caught in the surf along Jensen Beach. 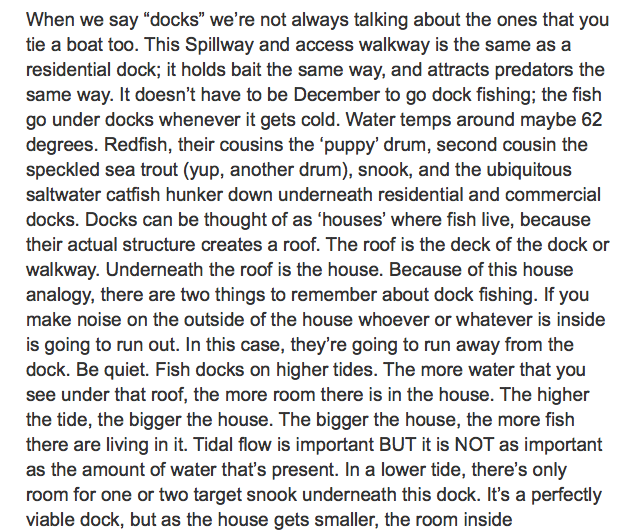 The best action is around the higher tides during early and mid-morning hours. There has been a great trout bite on the east side of the Indian River, and the redfish action is the best it has been in years. Fishing near the Stuart Causeway has been productive, but they’re also being caught around docks on the west side and around bridges. The bite should get even better once the water cools a bit. Flounder are being reported around bridges, but also in the grass flats and sandbars. 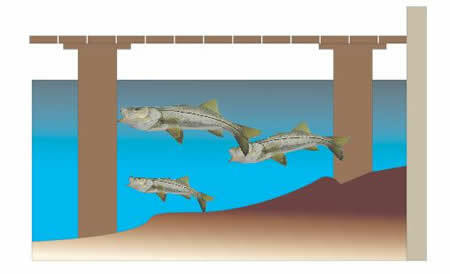 Snook are also chewing near bridges, docks and other structure, especially at night. Bluefish, Spanish mackerel, big jacks and scattered pompano are being caught throughout the day from the beach in Jupiter. In the Intracoastal Waterway and Loxahatchee River, good numbers of mangrove snapper, jacks and sand perch are being hooked at the bridges. Snook are also being caught at night. Jacks and bluefish are being snagged from shore along Palm Beach. The action seems to be best early in the morning, but there are fish around throughout the day. More than likely, if there are bait schools in the area, you can count on the fish being there as well. Snook and snapper are biting around the bridges of the Intracoastal in central and southern Palm Beach County. As always, the best bite is at night. This has been a great week for catching bass on Lake Okeechobee. The water level is over 14 feet, so you can navigate the entire lake with no trouble; although the best action is along the outside edges and back in the grass. The bite really seems to be lasting throughout the day at this point, but early morning is still the best time to be out on the water. Live shiners are still working better than artificial lures. 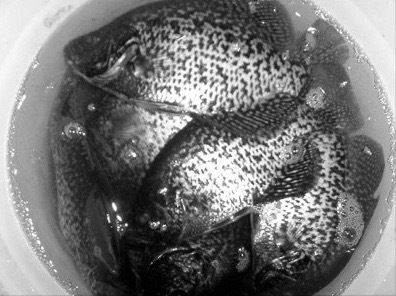 Good numbers of crappie are being caught in the rim canal as well. November has started out with some beautiful fall weather conditions. Sunshine and mild temperatures have been welcome to the anglers on the Treasure Coast! After the hot summer months, it's been a welcome change. Water temps have been in the mid to high 70's and that has been good for fishing. There has been lots of baitfish around the area and the fish have been enjoying an easy meal on them. It has been another exciting week on the water. Look for trout on the grass flats in two to four feet of water. DOA and Monster 3X shrimp are the best choice for trout fishing. 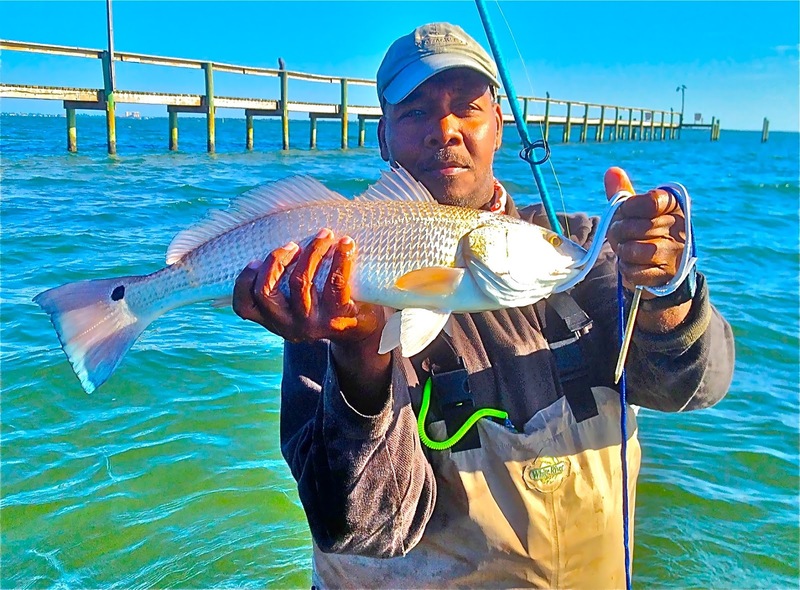 Redfish have continued to hang around docks and mangroves and can be caught on paddle tails and live or cut bait. 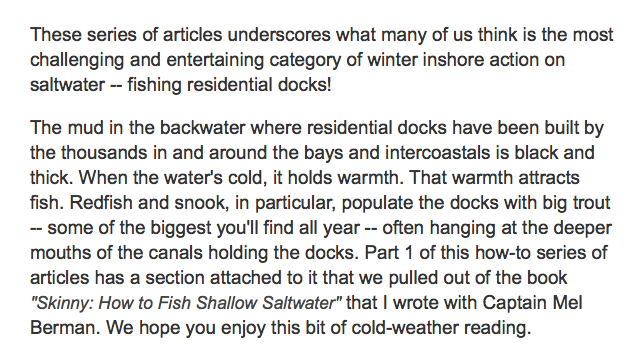 Snook have been hanging around bridges, docks and the jetties. Lots of big fish have come from the jetties this week. There have been jacks and ladyfish all over the river feeding on the glass minnows. Look for some Spanish mackerel in the mix as well. Docks are holding snapper, sheepshead and redfish. Don't forget to use those top water lures early and late in the day for some explosive action. We have a blustery, overcast morning at the inlet. Winds are blowing out of the East at 15 mph, gusting to 19 and the water is choppy. NOAA is calling for small craft to exercise caution today and has issued a small craft advisory tonight through Wednesday evening. Don't let the choppy conditions keep you from the inlet, Snook and Reds like it rough! 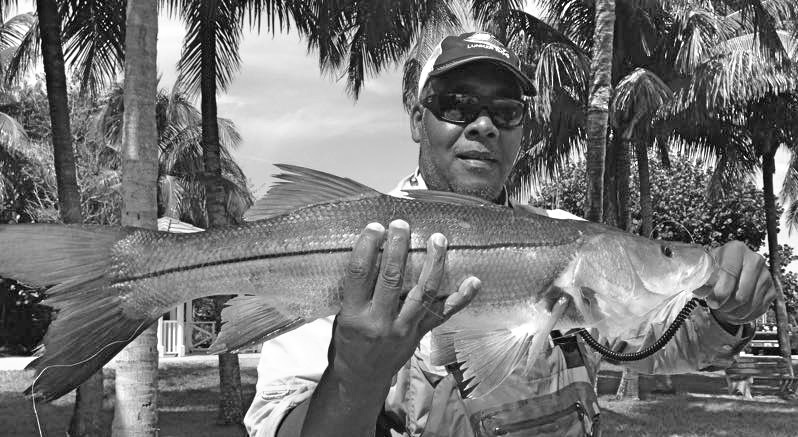 Anglers using live shrimp have been having the best luck with Snook and Reds. Take a rain coat along in case waves are crashing over the jetties. Other species are biting as well but Snook are ruling the catches. A few Black Drum, Mackerel, Sheepshead, Margate, Jacks and Blues are coming over the rails. Our first angler today is Harry Cassarina of Atlanta, GA. Harry spent the past two weeks fishing the inlet and did quite well with Snook and Reds. Harry was using live shrimp to land the 31.75" slot Snook in photo one. Inlet regular Victor Montalvo of Orlando is featured in our second photo. Victor landed the 25" slot Red. Lots of nice, dry weather this week with windy days most of the time. It's our fall season now and we can expect lots more of the same conditions. Look for cold fronts to begin filtering into the area now. Temperatures will be dipping into the sixties and sometimes fifties at night. Water temps have started to drop so it's time to slow down your retrieve. Give me the warm days anytime! Look for trout in two to four feet of water on the grass flats as the sun warms things up. DOA shrimp, live bait and top water lures will all work on the trout. Redfish can be caught on the grass flats, under docks and along the mangroves. They have been getting lots of them around the inlet areas as well. DOA shrimp or live baits have been working well. Snook around the jetties and sea walls has been steady. Live bait, feather jigs and DOA Terror Eyz are good choices for snook. 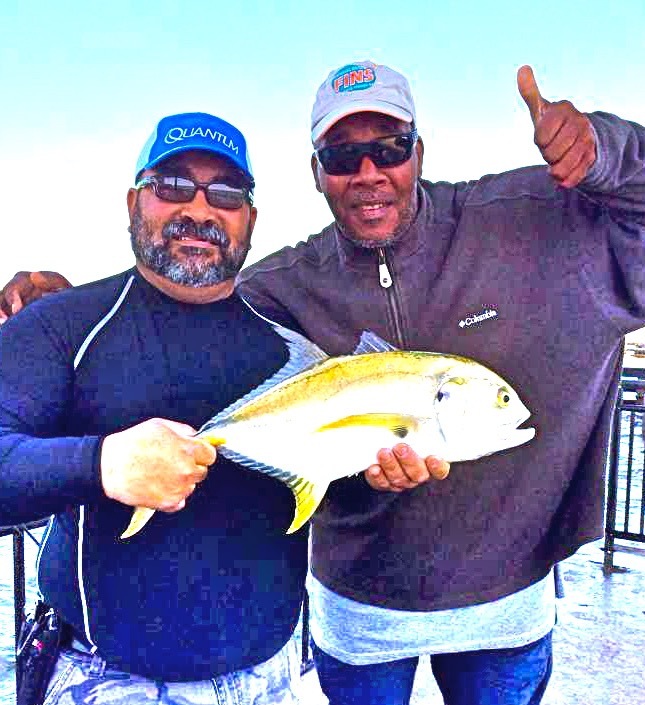 Its a good month to enjoy the fishing activity on the Treasure Coast. 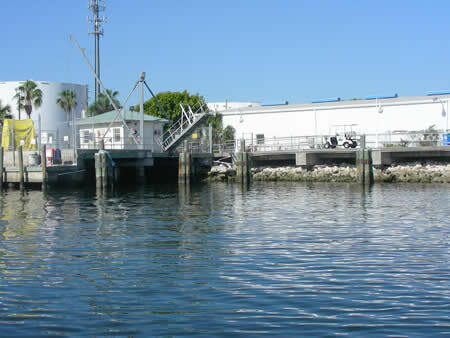 Mackerel, jacks and ladyfish have been heavy around the turning basin in Fort Pierce. Snapper, sheepshead and black drum are hanging around many of the docks and been nice sized fish. Live or dead bait always works well for them. Have fun and get out fishing soon! Look for the water temps to start cooling down as the fronts start to move in from the north. 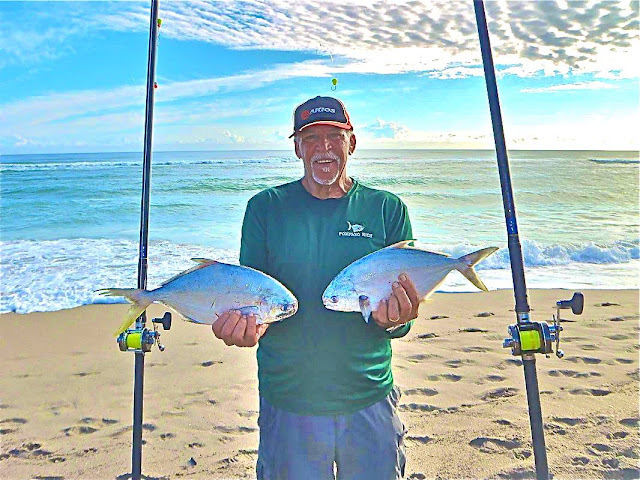 As this happens look for the Ft. Pierce Inlet to come alive with spanish mackerel, bluefish and plenty of jacks. Along with those fish there will be plenty of sharks. The bait of choice will be anything shinny like a small Clark spoon or a Gulfstream Flash jig. Most of these fish will be easy to find as they will be on top feeding on the small bait fish. Also along the Inet look for a good push of pompano working their way to the river. Try a Doc's Goofy jig tipped with a piece of shrimp. Or you can use a clam strip or a sandlfea in fish it on the bottom using a pompano rig. Look for croakers, black drum and sheepshead to start showing up in numbers and they will be taking shrimp fished on the bottom around the docks or any structure. Try using a 1/4oz. trol-rite hook fished on a 20 pound fluorocarbon leader. Now up on the flats things will slow down some. Most of the trout will move to the deeper pockets and to the channel. Try using a live shrimp either free lined with a small #2 circle hook or a small 1/16oz. jig head. As the day heats up the fish will move up onto the shallow water then you will need to use a plastic bait live a D.O.A. Shrimp or a C.A.L. Bait fished very slow. The snook season will come to a close on the 15th but, for the first 15 days of December look for good action around the local bridges. Most of the fish caught will be on live baits like a mullet, pilchard or a greenie. But, a Flair Hawk in 1&1/2 oz. or 2oz. will also be a good option. The bite at the South Jetty for snook, redfish, snapper and bluefish has been about the best thing going. Inshore not many people got out over the weekend either with the windy weather but there were a few reports of some trout and reds around Big Mud creek up in the mangroves.The snook fishing around the bridges was steady on the outgoing tide with both jigs and live bait and should stay good with the windy weather.The pompano have been around J.C.Park on the incoming tide little green and pink Jigs have produced well. Winds are blowing out of the East at 14 mph, gusting to 17 and there is a moderate chop on the water. The rougher conditions have turned the Snook bite on and we saw plenty of them landed over the past three days. Tommy Turowski of the Sebastian Inlet Bait and Tackle Shop reported a good weekend for anglers using live shrimp. Yesterday afternoon the Snook were following schools of mullet and pinfish which also brought in Spanish Mackerel and Blues. A few Reds and Black Drum were in the mix as well. Our First photo today is of Mike Kondrat of Sebastian. Mike landed and released this beautiful oversized Red. 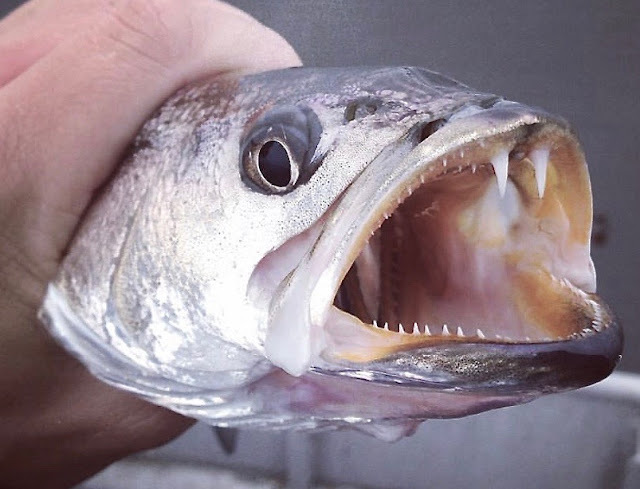 The Snook bite remains strong at the inlet. 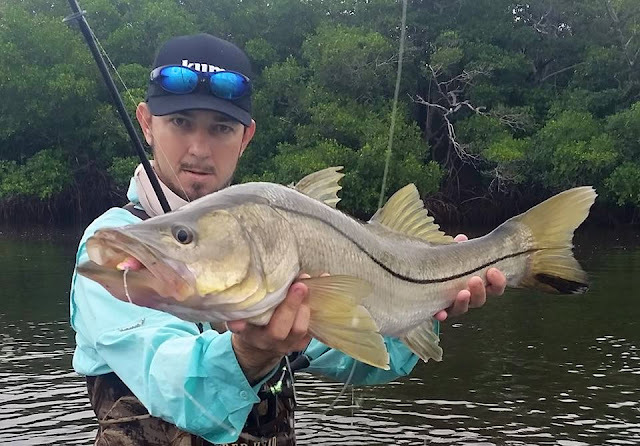 PLEASE handle C/R Snook with care, they are delicate and cannot be kept out of the water long. Try to return the Snook to the water via net if possible. If not, put the fish in head first, away from the rocks. Take your photographs quickly. If you know a fish is too short or too long don't take the time to measure it, get it back into the water. We must protect our resources, they are not unlimited. Large Reds and a few slot Reds are coming over the rails of the north jetty and for anglers fishing in boats near the jetty. Tommy Turowski at the Sebastian Inlet Bait and Tackle Shop reported Mackerel in the surf and yesterday he landed a 4 lb. Cero. We received an update and photo from Laura Weinberger who fished the inlet last weekend with her dad, Bill. 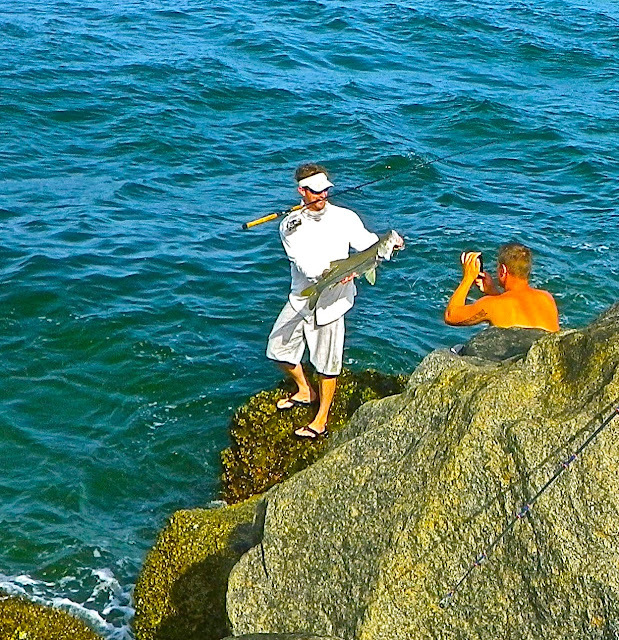 They fished all night and reported non-stop action on the north jetty. Snook and Reds were active and Laura poses with a large Sheepshead and Margate in photo one. Photo three is of inlet regular Chuck Fischer of Satellite Beach. Chuck made a rare weekend appearance on Sunday morning and went home with a 29" slot Snook. Brian Aviles of Longwood fished the inlet for the first time and went home with the 26" Spanish Mackerel in our last photo.